American manned Mars expedition. Study 1988. In 1988 NASA made four case studies of a rapid response to the threat of a Soviet manned expedition to Mars. The Mars Evolution case study built a capability that would lead to the development of a self-sufficient, sustained human presence beyond low-Earth orbit. This was accomplished in two phases: the establishment of a permanently staffed facility on the Moon, progressing to the establishment of a similar outpost on Mars. A substantial infrastructure would include production of oxygen on the moon and rocket propellants on Phobos and Deimos. Electric Cargo Vehicles would move payloads from low earth orbit to the moon, and from the moon to Mars. Only after a substantial infrastructure was built up in Mars orbit, would landings take place, at around 2010. The evolutionary approach provided the basis for continuing technology advancement, experience in outpost development and habitation, use of local resources, and the development of a facility with opportunities for further growth. The case study was constrained by a limitation of mass to LEO in order to promote creativity in new technology applications and in-situ resource utilization. The lunar phase of the mission included the development of a lunar science and resource outpost, which was dominated by a lunar liquid oxygen plant, local-to-regional geological exploration, and a life sciences laboratory facility for conducting fractional-gravity research. Because the location of the outpost could be dictated by resource and operational considerations, and not observational science, a far-side site was not mandatory. Cargo and piloted lunar space vehicles would be used to optimize delivery of payload and crew exchange. The lunar outpost would be capable of permanent habitation, and crews would occupy it for periods of six months to a year between rotations. Subsequent to the development and operation of the lunar facility, and after a knowledge base for extraterrestrial human habitation was established, human exploration missions to Mars would be undertaken. Oxygen produced on the Moon would be made available for the Mars spacecraft, which depart from the Moon to Mars via an Earth flyby injection maneuver. Conjunction-class trajectories were used, with separate cargo and crew vehicles. These trajectories required approximately one year of stay time in the vicinity of Mars, either in orbit or on the surface. The emphasis in these scenarios was the local-to-regional geological exploration of the surface of Mars, using piloted and robotic mobility systems, and the exploration of Phobos and Deimos, with the objective of establishing the capability to extract propellant from one of the moons to support subsequent missions. The study envisioned three missions to the Mars system, each to a different site, in preparation for the establishment of a permanent outpost on Mars. Beginning approximately 2004, a series of piloted and cargo flights would embark for the Moon. The crew would transfer to the Moon aboard chemically propelled transfer vehicles, whereas the surface equipment would be transported via an Electric Cargo Vehicle. Several years would be spent in constructing a permanently staffed surface facility. Experience would be accumulated in all aspects of long-duration human planetary exploration missions: life sciences, psychological effects and human dynamics, exploitation of natural resources, and scientific exploration. One goal of the base was to produce, from the lunar soil, the liquid oxygen needed for subsequent Mars flights. In approximately 2010, the launch to Mars would take place. The specific timing was left open, but in general would occur when the lunar capability was sufficient to provide enough propellant to enable the Mars mission. First, an Electric Cargo Vehicle would carry the Mars surface equipment, excursion modules for transportation between Mars and Phobos, and various types of scientific equipment to the Mars system. As the spacecraft approached the Mars system, it would drop off communications satellites in synchronous orbit, send robotic explorers to Deimos, and, upon arrival at Phobos, deposit a system for producing fuel. Liquid hydrogen and liquid oxygen propellants produced on Phobos would be used later in the scenario. In the next Earth-Mars launch opportunity, a second Electric Cargo Vehicle, reused from the lunar portion of the mission, would push an (unmanned) crew transport to the Moon for fueling with lunar liquid oxygen. After fueling, the cargo vehicle would leave lunar orbit with the fully loaded Mars personnel vehicle, and, when in cis-lunar space, would separate and began its return to a lower orbit about Earth, where it would await reuse on the next ferry mission. The first crew was transported to the piloted Mars transfer vehicle, and after systems check, they began their journey to Mars. The nominal plan was for the crew to stay at Mars approximately one year, and return to Earth after a total mission time of nearly three years. Options exist for the crew to perform a flyby abort mission (if a problem occurred, the mission could return to Earth without landing on Mars, after a total trip time of about 600 days), or to limit their stay at Mars to up to 60 days. A third option existed for a two-year stay at Mars. Piloted excursions to Mars, similar to the first described above, were anticipated in the ensuing launch opportunities. Further cargo flights would be necessary over the duration of the Mars base build-up. The evolutionary case study placed major demands on the low-Earth orbit operational facilities to assemble, refuel, maintain, and service interplanetary vehicles. The facilities would also be used to transfer substantial quantities of propellants arriving from Earth, and would serve as a transfer facility for crews going to and returning from planetary missions. This case study also required orbital staging and refueling operations in low lunar orbit, as well as in the vicinity of Phobos. The electric cargo vehicle served as a mobile node for operations outside low-Earth orbit; therefore, nuclear electric propulsion system technology to power the electric cargo vehicles was a major requirement. Systems and techniques for aerocapture at Mars and Earth were also needed. Electric Cargo Vehicle. The ECV was the primary cargo- carrying element of both the lunar and Mars portions of the Case Study. This vehicle employed a nuclear reactor to power ion engines, producing a constant, low-thrust means of propulsion. Three were used in the case study, one of which delivered the first load of cargo to Mars and remained at Phobos. The first ECV would be delivered to LEO in 2002. The first operational flight occurred in 2004 with the commencement of the LEO to LLO (lunar low orbit) spiral and the eventual delivery of the first lunar cargo to the lunar surface. This ECV would be used for one additional lunar cargo mission before being used for the first Mars cargo mission in 2010. The issue of humans in the presence of nuclear reactors for the ECV had yet to be resolved. Consequently, future studies were needed to resolve this issue, and the power system and the performance parameters presented were considered very preliminary for this vehicle. Lunar Transfer Vehicle. The LTV transferred crew and some supplies from the LEO node to and from LLO. Once in LLO, the LTV made rendezvous with the lunar personnel lander (LPL) or the ECV. The crew descended to the lunar surface in the LPL. The LTV was chemically propelled and used an aerobrake for aerocapture into LEO from LLO. Lunar Operations Vehicle. The LOV was the core component of the three lunar landing vehicles: the lunar cargo lander (LCL), the lunar personnel lander, and the lunar propellant tanker. Lunar Cargo Lander. The LCL was the basic version of the LOV. Lunar Personnel Lander. The LPL configuration was derived by attaching a crew module to the LOV and removing unnecessary propellant tankage. Lunar Propellant Tanker. The LPT configuration was derived by attaching lunar oxygen (LLOX) tanks to the LOV and adding propellant tanks. Mars Piloted Vehicle. The MPV was used to transfer crew from LEO to the Mars system. The MPV consisted of three primary elements: the interplanetary habitation module and life-support systems, the outbound stage, and the return stage. The vehicle was initially assembled in LEO on the ECV and then carried piggyback on the ECV to LLO. Here, lunar base cargo and hydrogen were exchanged for LLOX. The hydrogen was used in the LPT, which delivered the LLOX to LLO for use in the outbound and return stages of the MPV. Once the MPV was filled with LLOX, the ECV spiraled away from the Moon and put the MPV into a high circular orbit about the Earth. The ECV returned to LEO, and the LTV, carrying the Mars crew, made rendezvous with the MPV. The LTV returned to LEO and the MPV performed its Earth escape bum. Mars Logistics Lander. The MLL was used to deliver payloads from the ECV to the Mars surface. The MLL's were delivered by the ECV to the Martian system where they separated from the cargo ship and used an aeroshield to shed velocity as they descended to the Martian surface. Mars Crew Sortie Vehicle. 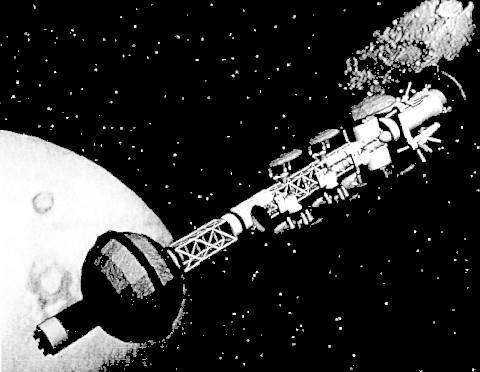 The MCSV was used to transfer crews from the MPV to the Mars surface, Phobos, and Deimos. The MCSV's were delivered to the Martian system by the ECV. Family: Mars Expeditions. Country: USA. Agency: NASA. Bibliography: 1989, 4414, 4415.